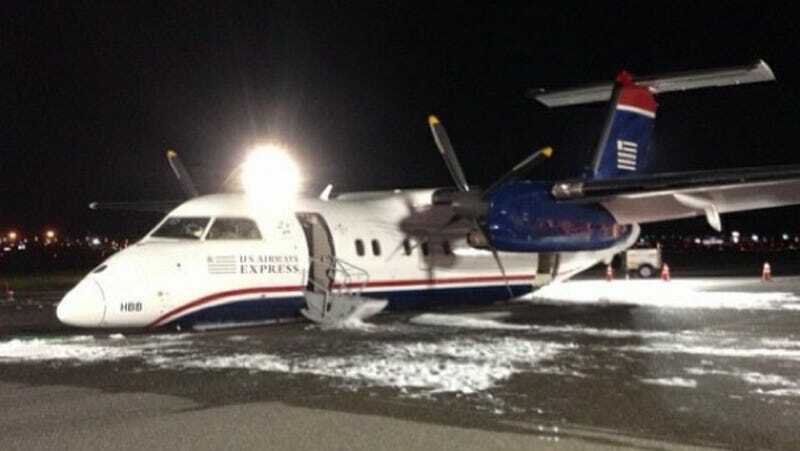 Last night, the pilot of US Airways Express Flight 4560 was having some bad luck. The landing gear on his turboprop twin-engine plane just wouldn't go all the way down. So with some quick thinking and righteous piloting skills, he went in for a wheelless, sparky touchdown, and pulled it off without a hitch. After trying the landing gear a bunch of times and failing to get it fully deployed, the pilot—named Edward Powers according to witnesses—decided that a carefully controlled skid was the way to get out of the sky safely and minimize any dangerous veering on the runway. In preparation, he circled Newark airport until he was out of fuel, to minimize the chance of a fire, and took her down with all due care. A nearby air traffic control tower caught the footage. It's hard to make out much more than the rain of sparks, but there were plenty, and the plane was accordingly doused in foam the second it came to a stop. But thanks to Powers' fuel-burning circles and piloting skills, there was no fire at all. In fact, there weren't even any injuries among the 34 passengers and crew. The landing of the aircraft on the ground safely is testament to how well our crews are trained. They are trained to think quickly and assess the situation and act with the utmost professionalism.